Timmy Mallett – from ‘Im A Celebrity, Get me…’ to the art gallery?! In our previous blog on Timmy Mallett, we delved a little into his past & how his love for art began many years ago. Today we will start to comment on his actual art work. 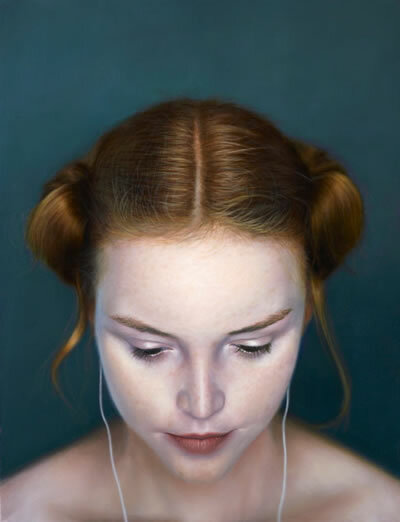 After his stint on British TVâ€™s “Iâ€™m a celebrity get me out of here” 2008, Timmy made the decision to concentrate more on his art & the process of choosing which of his painting he felt where good enough to produce limited edition prints from. Many remain surprised to hear that he paints & on viewing his art, are even more surprised at the depth of his artistic talent. 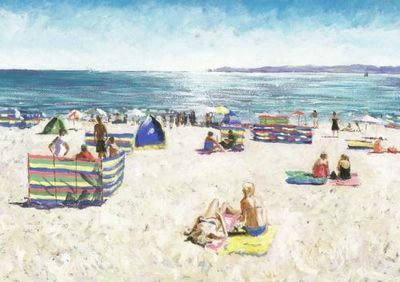 I do feel his painting style juxtaposes his zany personality and wacky dress sense because he often uses sombre colours in his pieces & typically he paints ‘traditional landscape’ subject matter: such as fields, streets and houses. However, I can see that he subtly adds unorthodox colours to his art, brightening up pictures and giving them a somewhat unique ‘Timmy’ style. ‘Tower Bridge’ is one such piece. 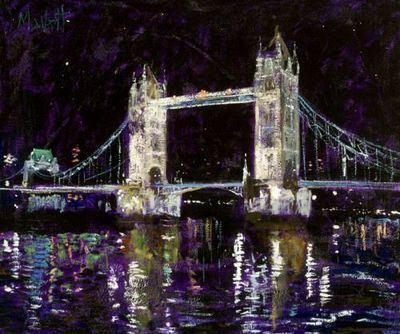 He has added purple and blue as well as a little green, which help accentuate the reflections on the river Thames. 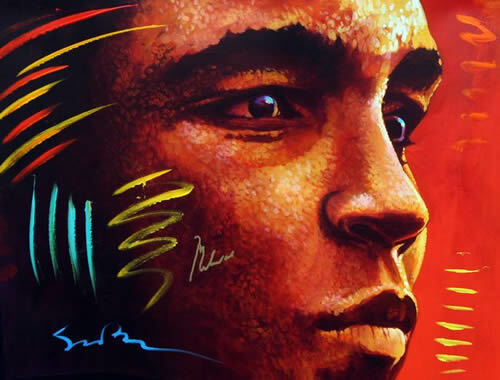 I love what he has done with the colouring here, making the piece vivid & eye catching despite being quite dark. To see its true greatness you need to be in its presence as a computer screen can not do it justice. 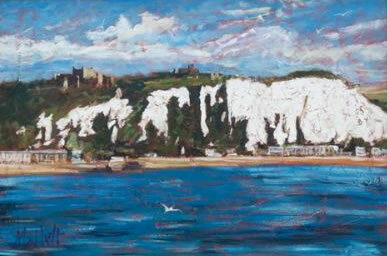 Again ‘Oh To Be In England’ is another painting you need to be in front of to truly appreciate & take in. Clearly painted with the use of oil, the cliffs are built up with thick paint and the sea and the sky have there own unique colours & textures. As you gaze more at the picture you notice the castle on the landmass and to the right of it your eye flickers over to the church on its right. A few more minutes starring & the seagull then comes into view, what a subtle use of white paint to create the little fella. As an artwork it is superb & clearly Timmy has a talent that has only just started to come to fruition. Artist Nicky Belton – shes not all bras & knickers you know! Nicky Belton is a popular contemporary artist with a lot of influence from the textile and fashion industries. Her preferred mediums are handmade papers and bright inks, which she uses to create her Original paintings. This style may sound unusual but it matches her art perfectly. 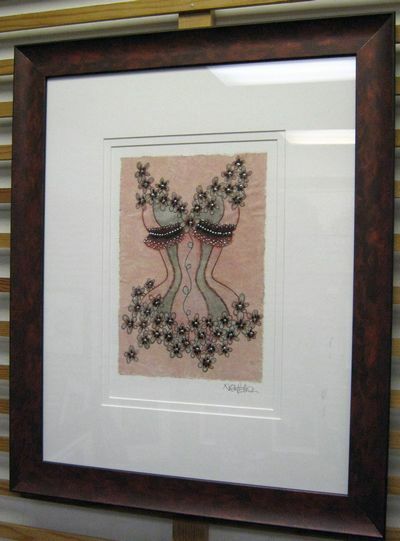 Her limited editions are then reproduced from these original works. Nicky Belton is most well known and loved for her pictures of corsets and other lingerie, however she also paints cats, dogs and female accessories such as handbags and shoes. This means that her art tends to appeal to women a little more than it does to men but I have still heard men say how beautiful her art work is! Her designs are beautiful yet a little bit saucy. Her original art with their intricate designs & colours actually matches the colour & feel of the paper well. The slightly creased, materialistic texture of the handmade paper gives an interesting look to the artwork and I donâ€™t believe it would looks as good without it. 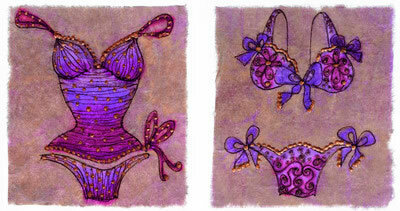 I especially like her pictures of corsets with pretty designs of flowers embellished with silver paint. The colours in these pieces are more subdued yet opaque. I think it worth paying that little bit extra for an original piece of artwork, after all, how could one not appreciate more the handmade paper and the hand-embellished artwork? Of course all original work is unique – so when a person buys a piece of her art there will never be another exactly the same & that is another reason buyers prefer them. I have heard several viewers say that if only Nicky actually made the lingerie accessories she paints, because they would buy them!